The kinglets may be the first to split off within Muscicapoidea, or maybe they group with the Bombycilloidea and both with Certhioidea. Either option finds support from Barker et al. (2004), Treplin et al. (2008) or Johansson et al. (2008b). Either option leads to the same linear order. I'm now treating the situation as a polytomy, in the order Reguloidea, Bombycilloidea, Muscicapoidea. The continued uncertainty about how the pieces fit together is a major reason for retaining separate superfamilies (see also Spicer and Dunipace, 2004; Voelker and Spellman, 2004; Zuccon et al., 2006; Reddy and Cracraft, 2007). It's also possible that that the Hyliotidae also belong somewhere around here, although that is starting to look less likely. The taxonomy of the kinglets is based on Päckert et al. (2009, 2012b). I rely here on Spellman et al. 's (2008) comprehensive study of the waxwings and allies, Fleischer et al. (2008) for the mohos, and on Alström et al. (2014). As Spellman et al. note, the surprising inclusion of Hylocitrea “further demonstrates the need to reconsider the systematics of many Wallacean taxa using molecular techniques.” Needless to say, the inclusion of Elachura in this group also came as a surprise. 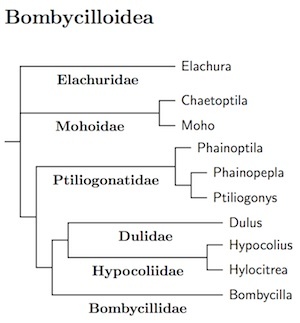 The ordering within Bombycilloidea is somewhat uncertain. None of the papers included all the families, and the relationships found don't really match. I had previously speculated that Elachura, often classified in Spelaeornis, was not a babbler, but possibly related to Pnoepyga. I was half-right and half-wrong. 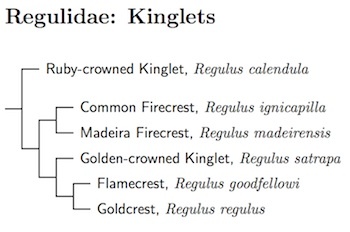 It's not a babbler, but somewhat related to waxwings (Alström et al., 2014). I had also speculated that two other Spelaeornis may belong with Elachura. Alström et al. showed that those two are true Spelaeornis. The Hawaiian honeyeaters were long thought to be part of the basal oscine family Meliphagidae, which has spread widely across the Pacific. Fleischer, James, and Olson (2008) have shown they are actually related to waxwings. The Mohoidae are an impressive example of convergent evolution. They look nothing like their relatives, but instead appear very similar to birds with similar island lifestyles. The original spelling Ptiliogonys has been restored. See Gregory and Dickinson (2012). Hylocitrea was thought to be a pachycephalid, then (Jønsson et al., 2008) suggested it might be a sylvioid. Most recently, Spellman et al. (2008) found it nested in the Bombycilloidea, near Hypocolius. Hypocolius has been considered of uncertain affinities, but Spellman et al. place it firmly in the Bombycilloidea.